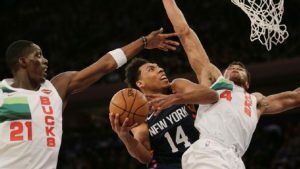 As he walked off the court at Madison Square Garden on Christmas Day, Giannis Antetokounmpo received the kind of ovation that’s normally reserved for the home team. Making things worse, their best player, All-Star big man Kristaps Porzingis, remains sidelined indefinitely while he rehabs an ACL injury. And it remains an open question as to whether Porzingis will play at all this season. Knicks president Steve Mills said earlier this week that Porzingis was “a ways away” from returning to the court, nearly 11 months after his ACL tear. The 7-foot-3 forward recently began working on the court with coaches, dunking and shooting pull-up 3-pointers, and he’s expected to be re-evaluated in mid-February. Knicks fans haven’t had many reasons to applaud their own team over the past three months. New York has lost nine of its past 10 tilts and owns the third worst record in the NBA. The Knicks seem well on their way to a fifth consecutive season of 50-plus losses. Knicks head coach David Fizdale said he doesn’t expect Porzingis to return to practice any time soon. But he has been effusive in his praise of Porzingis’ leadership during this rehab.